Why the Outside In? A Story. Storytelling is a positive, life-giving and exciting art form. In its purest sense, it can bring people together, build communities and help people find meaning from chaos. In addition, in the body of a focused storyteller and artist, storytelling is tremendously entertaining, matching and rivaling all other performing arts. In may ways, storytelling is the mother of all other performing arts. Mishandled and misused, the art of storytelling has shadow sides of narcissism, intimidation and irrelevance. We're ready to start talking about our "Outside In Storytelling"(tm) project. I've had a number of chances to present the "Outside In Storytelling (OIS)" concepts to others in classes and coaching sessions and the response has been very good. For some time, I've been developing the process of OIS focusing on three circles or areas of excellence. The OIS processes (both training and coaching) allow for anyone of any skill level to enter storytelling as the audience-centered art form it is. Two of the three circles apply to anyone wanting to use storytelling for any aspect of their lives and vocations. By that I mean that OIS is for all people from those who are storytellers as an adjunct to their jobs in such fields as education or ministry, to corporate storytelling, to those seeking to make their primary livelihood as a working artist. The third circle of "business excellence" is the essential (and most poorly understood) circle for anyone who wants to move into the full- or part-time world of the professional storyteller. With more than 10 years of Storyteller.net (and twice that much time personally) watching storytellers come and go, we know how much this particular circle is a source of tension and controversy for individual tellers and the storytelling community. It's for this reason we've launched the first of many OIS projects: "The Outside In Storytelling Boot Camp". It would be easy to think this is all about money and not about art. That's not it at all. Let me tell you a story. One of our tellers on our site is a talented artist who has practiced a variety of art forms for many years. We are going to call this teller "Chris" which is not their real name. Chris has mastered the concept of the "niche" and presents some things that other storytellers have never presented. Chris has the skills to both develop programs and to present those programs professionally. However, Chris is slowly dying in the "business circle" of storytelling. Chris is working multiple shows in their home city. When you calculate the time they spend in travel, prep and presentation, Chris is making less than minimum wage, putting huge mileage and wear and tear on Chris' vehicle and body. When I've spoken to Chris about this, the answer is, "Well, it sure beats flipping hamburgers and besides, I'm not about 'the money.'" No, Chris, you are wrong. When you don't have enough to live on, when you finally succumb to the breakdown of your body and vehicle that you are headed for, who will take care of you? The answer is "no one." Chris has the skills to survive and thrive as an artist, being able to rely on their own work to support themselves, not having to rely on the income of a significant other to help them along. Chris doesn't have the business skills and somewhere along the way decided that being good at business means being less of a true artist. Chris has decided that being a starving artist is somehow a moral victory. It's not. It's a loss. I'd like to see less artists suffering like "Chris" out there. I do want to see more artists having the money they need to excel in their chosen art forms. Although there are three areas of the OIS experience, we've chosen to start with the business and marketing side as our first major endeavor. Our "Boot Camp" is the artist's-eye-view marketing training experience for working artists and those who want to be. If you'd like to know more, I invite you to come read and browse the new website at http://www.outsideinstorytelling.com . Come to Arizona for February. It's warm. There's no snow. However, there will be a blizzard of learning and growth for you and your art form. There were still early-bird prices when I wrote this. One Solution to Your Marketing Questions. the "Outside In Storytelling Boot Camp." The OISBCamp is "The Artist-View Marketing Training Event for All Working Artists and Those Who Want to Be." preparing this event. I've distilled down many years of marketing and business research and decades of experience to make this new process laser-focused on what working artists need to know. I hope you can join us. "Outside In Storytelling" is a new way to look what excellence as an artist consists of, focusing on three circles of excellence as our base. Through the "Outside In" process you'll explore excellence, mind-shifting and marketing in an audience-centered and "no shiny-poofy language" environment. I am excited to finally be launching this. Visit the website for details and possibly get one of the limited Early Bird registrations. There will only be 20 -- Just 20! -- registrations accepted in total for the three-day session. 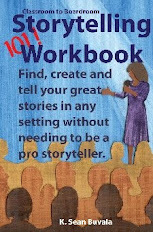 "The Outside in Storytelling Boot Camp:"
Those Who Want to Be. Limited to just 20 students! There's a limit on Early Bird registrations so go look now at what we're offering. Thanks. Our latest Storyteller.net free podcast is now available. The podcast features excerpts from Storyteller.net director Sean Buvala’s keynote presentation to the Avondale School District’s Staff Gathering. Some 700 people enjoyed Sean’s stories and commentary. The September 2007 podcast includes the stories "The Emperor and the Dragons," "Catching Fire," "The Story that Does Not End," "Crow can Taste Good." There’s a "coaching moment" on how to get people to turn off their cell phones, too. Sponsored by Storytellingproducts.com. This pod cast features storytellers Sean Buvala and Buck P. Creacy. Listen in when you click here now. You can find the podcast at Itunes. You can find our previous podcasts at this link here. Three Minute Tales by Margaret Read MacDonald.